Over the past dozen years, Gary Condon has taken the gospel message to hundreds of places through performances of the On Call groups he directed. Based from the Youth For Christ office in Willmar, the musical group takes the best high school singers and musicians in the area and spreads the Christian message through contemporary music. Condon has selected the 30-some members for the two On Call groups he directs, rehearsed with them, oversaw some 30 concerts by each group per year, and taken an annual overseas trip with a combined group of 20 members each summer. 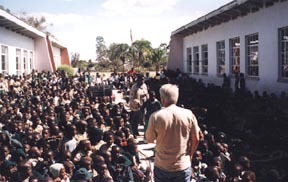 Gary Condon addresses an assembly of school children in Zimbabwe. Soon, though, he will be pursuing a different calling to share God's message. "I've always enjoyed, throughout my whole life, building rather than maintaining," he explained. "While On Call has been my best work and my best job, I still have the inclination to build, so it's time for me to move on," he added. Condon's next project is family oriented. He, his daughter Leah Norris (a former Paynesville resident), and his sons and brother are putting together young musicians into a contemporary Christian band. Leah writes songs that will be used by the group and will serve as the musical director, at least initially. Other family members will also help develop the sound. The only family member slated to be in the band's lineup will be Condon's granddaughter, Melinda Norris, who will sing with the group and play percussion. Becca Gardner, a senior at Paynesville Area High School, will also sing for the group, as well as play percussion and keyboards. Unlike On Call, where he was called on to drive the bus, set up equipment, direct the group musically, even wake up the band members while on tour, Condon expects to fulfill a more administrative role with the new group. He expects the band will be able to tour without him, allowing him to spend more time at his Lake Koronis home with his wife, Delores. The band - which has members from Florida, Virginia, New Jersey, and Minnesota - starts rehearsals in Washington, D.C. in June. They plan to tour camps in July, head to California in August, where Gary's brother works as a studio musician, and record some songs while there. International touring could start in Guatemala in mid-September, with a national tour and a trip to Hong Kong in the works for 2002. The new opportunity intrigues Condon because of the possibility to work with his family, especially his children. "We're going to do something that we've dreamed about for quite a while," he said. It also is another opportunity to spread God's message. "If you're in the Christian genre, your goal should be to present the Good News," he explained. "My job will be to make sure that the message reaches the people." The band's name - Freelunch. - emphasizes that goal. "The free lunch is the gift of salvation," he said. Using rock music to spread that message follows the legacy left by the Apostle Paul, the greatest evangelist, said Condon. He considers Paul's greatest strength to be Paul's ability to suit his delivery to the audience, whether that meant an eloquent oration to a Jewish group or a Socrates-style dialogue to the Greeks. While building a new group to share God's message excites Condon, leaving On Call won't be without sadness. He says he will miss working with talented, nice kids. The intensity of On Call got him to know the students very well. 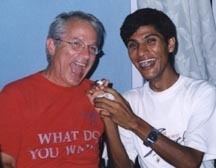 One unique part of On Call was the summer mission trips, which has taken Condon from India and Nepal, Guatemala and Honduras, to Kenya and Zimbabwe. While on those trips, working with Youth For Christ internationally, the group has specialized in programs at schools. "We don't care if we're ever in churches," he said. "We want to take the gospel to places it's needed." Condon, who has taken 19 international trips, including a dozen with musical groups, credits the travel for influencing some of the young musicians. He sees the benefits in the number of his former band members who are in international relations, languages, and social services. 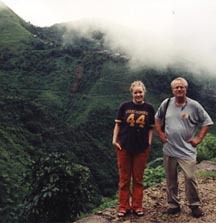 Gary with his granddaughter Melinda in Guatemala. Condon, who originally hails from the western United States, earned a music degree from St. Cloud State University and taught high school choral music for a decade. He also ran a group home with his wife in Litchfield, her hometown, and worked on an inner-city project in Washington, D.C., before starting with On Call. An open house retirement party will be held for Condon at Calvary Lutheran Church in Willmar on Saturday, May 19. The event, featuring a performance by On Call alumni, will run from 7 - 9 p.m.
His last concert with On Call will be on Sunday, May 20, at the Evangelical Free Church in Willmar starting at 6:30 p.m.